Ever since the early days of SEO, people have found ways of gaming the Google algorithms that decide where to rank your site. In fact, with very little knowledge, in the early days, it was quite easy to rank almost any site at number 1. And many did. Google was incredibly unhappy with the manipulation of their algorithms which caused poor user experience for their searchers. So they decided to do something about it. They began to hand out penalties for sites that were found to violate their guidelines. There are two main types of penalties. Handed out for specific violations. These are clear to see as Google communicates the nature of the penalty through the Google Search Console (GSC). In there, it details the type of penalty and what you can do if anything to remove it. Normally, this involves filling out a reconsideration request which is a way for you to notify Google that you have cleared up any issues and have taken steps to avoid creating such issues again in the future. The review process normally takes around 7 days and you are then notified if it was successful or not. User-generated spam – Usually handed to blogs or forums that do not moderate resulting in lots of people placing spammy links to third part sites. Spammy free host – Free hosting services often suffer from this. If other sites on the same host are spammy, Google may consider the whole host as toxic. Unnatural links to your site – Most common penalty we see. Either you or your previous seo company has used link building tactics that unnatural deceptive to manipulate your google page rank and therefore its rankings. Unnatural links from your site – As above but this time its your site selling links to manipulate rankings. All links sold should be tagged with a NOFOLLOW to put them within google guidelines. Thin content with little or no added value – Duplicated, scraped, useless content that adds no value to the searcher. Cloaking and/or sneaky redirects – Trying to show users different pages to the one Google spiders crawl. Cloaked images – The practice of showing a user a different image to the one Google indexed and ranked. Provides users very poor experience and incredibly frustrating. Hidden text and/or keyword stuffing – An old over optimisation tactic where you use a keyword repeatedly to try and force the relevancy of that page in googles algorithms. AMP content mismatch – AMP page is different from the original or canonical page. Sneaky mobile redirects – As the title says really. Sneaky redirects targeted at mobile users. 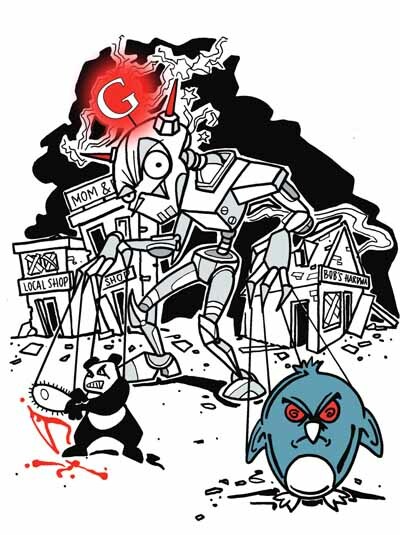 Penguin – Introduced in April 2012, Penguin is a machine learning algorithm designed specifically to look out for link building techniques and schemes that violate the google guidelines. Panda – Named after Google engineer who engineered the algorithm, Navneet Panda. Specifically designed to detect low quality content. Many speculate that thin, duplicate and non-engaging content are the specific targets for the algorithm. Reboot Online has fixed countless of penalties and managed to recover the traffic for the majority of them. In some cases, our actions have improved traffic many times over from even the original pre-penalty levels. Usually because our complete attack approach has cleared up not just the known penalty but sometimes unknown penalties that you were not even aware of. Identify – Analyse data from many tools and sources such as Analytics and SEM Rush to pinpoint the penalty and then match it with a known update. Full and complete audit of the site. Match the two to get a consensus on what the issue is if not known. Plan – Design a working plan with the client on how to fix the issues. Action – Get to work on the workplan in an efficient and quick manner. Ensuring that all teams are coordinated to reach the end goal. Recovery – Either submit a reconsideration request fully detailing the actions we have taken to remedy the situation or, in the case of algorithmic penalties, we continuedly monitor and adjust until the site fully recovers. Google wants to serve only the best sites for their searchers. We help you ensure yours is one of those. Whether its checking for toxic links or duplicated content, all core checks are done manually by our experienced experts. To streamline and prioritise the process, we do have a large variety of tools in our disposal. Some are inhouse tools specifically developed for the task. Our unique understanding derived from years of prodding and testing Google’s algorithms has put us in a unique position where our experience in this field is probably unmatched. Sometimes people confuse a sharp drop in traffic or rankings as a penalty. We have found many cases where an average site has dropped in the rankings purely due to a Google core algorithm update which has now re-evaluated the sites deserved ranking and has placed it in the more suitable ranking position. This is not a penalty but a re-evaluation of your site. In these cases, we would recommend a plan of action on how to make your site really deserve its position in the first page of Google. Depending on your industry and the levels of competition, this will likely involve using our digital PR services and/or high quality content marketing campaigns. But, as the old saying goes, prevention is far better than the cure. Never been so true then when it comes to Google potentially devastating penalties. By taking some simple steps to ensure you choose the correct SEO company from the word go, you could save yourself a lot of money and hassle in the future.